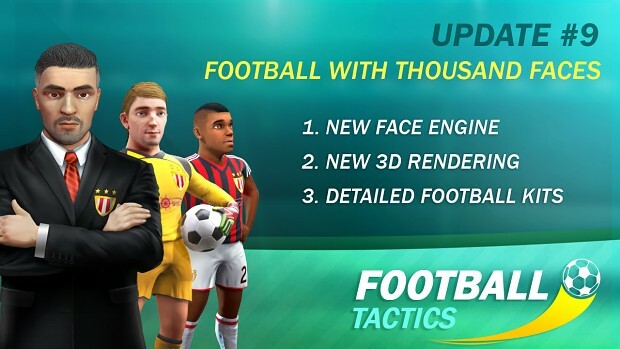 We created very detailed Face Engine for Football Tactics! There is nothing similar in other indie games. Especially, taking to account that our team consists from only 5 devs. Want to play with it? Download the Demo version with the full editor inside! At the first look, Football Tactics seems to be the game about tactics. But after some time playing it you understand that this game is about creating the team, about your strategical decisions and about the footballers. Earlier footballers in Football Tactics were cute, but their faces were similar to each other. Each of them has his own class, his own skills, attributes, age and level. However, it was almost impossible to differ them by sight. The game contained a very small amount of pre-baked faces. As a result, the half of your team might have one and the same face. For a long time, we want to add to the game the replays of the goals, the animations of entering on the pitch, the goal and victory celebrations. But it all makes little sense when you can not differ the footballers by sight. Each your goal is scored not by just an ingot, but the person to whom you have some attitude. It was either a young player, to whom you gave a chance, or a strong forward, whom you bought for a time until the youth is growing up or maybe it was your veteran. The individuality matters not only for the footballers but for your club in the whole. In our old graphics engine, we were not able to show on your football kit the club’s and sponsor’s logo, and player’s number. As a result, the only difference the teams on the pitch had is a color and pattern of the kit. Update #9 makes your playing experience more individual! 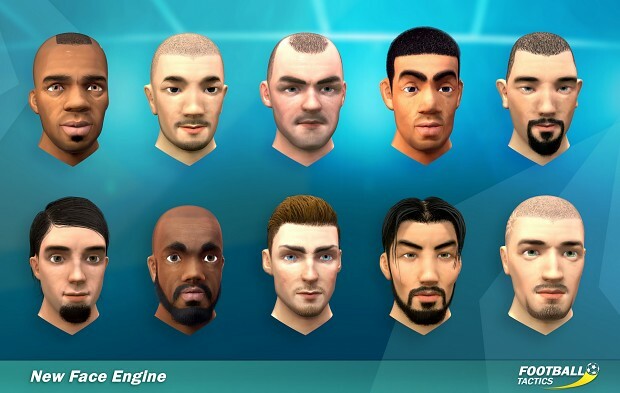 Last fall our artists started to develop the technology of Face Engine. In 8 month, at the beginning of summer, we understood that we can implement it in the game and started to work on Update #9. The development was moving hard because we are a small team. However, I believe that we managed to raise the level of the graphics to the new level. So, what is waiting for you in this update? Now every face in the game will be unique. The Face Generator creates the faces from around 150 settings. It also takes to account the footballer’s nationality. Therefore, for example, in Spain, your footballers will look differently than in England. Your saved campaigns will update automatically. Every your footballer will get a new face based on his nationality. You will see your footballers not only in the matches but in all screens where there is the information about selected footballers: MVPs, Contracts, Info etc. If you don’t like the look of any your footballer, just click on him, go to the “Info” screen and press the button “Change”. It will open the Face Editor. There you can create a new face for your footballer. Also, the Face Editor is available from the League Editor. It means that you can create the faces for the modifications. 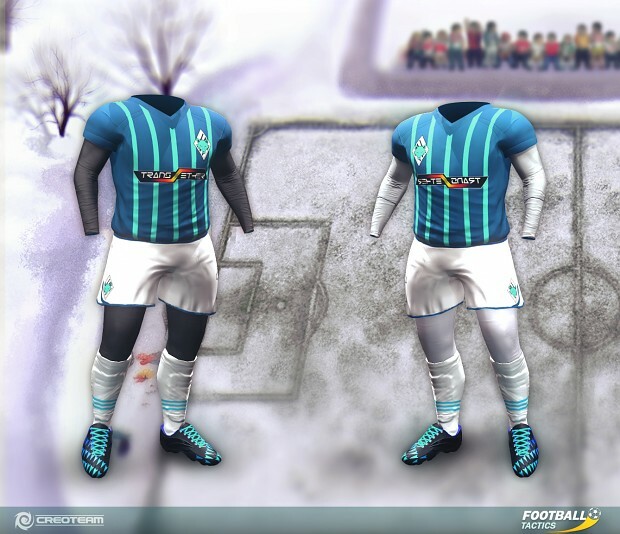 To make the new faces and kits look nice, we rewrote our graphical engine. Even though there aren’t many places in this update where you will see the new renderer, it serves as a base for the future improvements. Now the football kit of any team will show the club’s logo, sponsor’s logo, and the footballer’s number. You can change the number on the “Info” screen. Interestingly, that in support of our commitment to making every player unique, we made it so that not all the footballers choose the standard numbers. You can notice that some footballers choose the numbers with their birthday or just some nice number. Some teams do not allow players to choose the number 12 as it belongs to their fans. So, in such teams, you won’t see the footballers with this number. Unfortunately, the footballers’ names won’t be shown in this update. But we will implement this feature in the next update. Almost from the first day of release in Early Access players asked us to add a goalkeeper kit. We wanted to add it, but we also knew that we are going to significantly rework the overall graphics. So we postponed adding the kits to the Update #9. In the new update, there will be two goalie’s kits. One – for the home teams and another – for the away teams. When we see the possibility to add something to the game which would add more immersion and at the same time is reasonable in development, we do it. That’s why we added thermal underwear. It appeared that adding it is not very hard. However, in the warm countries such as Spain, you will never see the thermal underwear. To make you see your footballers a bit more, we added the new kick off animations. Many players said that they like the stylization of the footballers. But with our general graphics improvements, the footballers’ style couldn’t stay untouched. Therefore, we have made all the changes, trying to preserve the uniqueness of our style. Firstly, we significantly increased the level of the details. The old models consist of 800 polygons, but the new ones have more than 16 000 polygons. The 20 times more! For better understanding the difference, I’ll make an example. The one boot of the new footballer has 1,5 more polygons than the whole old footballer. But then we had a problem. 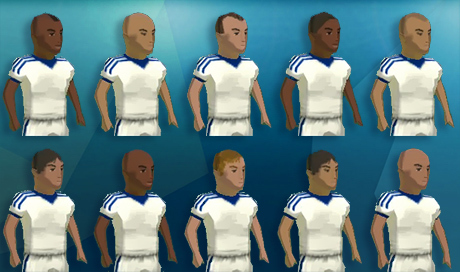 Trying to save the old stylization, we used the proportions of the old low polygonal footballers. As a result, many of you noticed that the new footballers have a bit short hands. The old footballers were so simplified that the short hands were the part of the stylization. However, it didn’t work for the new detailed models. By the way, all images in this article, except kick-off animation, show the footballers with short hands. But in the Update #9, the hands are fixed. Remaking the hands carried a lot of other reworks. We had to change all textures and the most important – all game animations. It was really a huge amount of work. But we did it. Because one such detail could spoil the impression of the whole new graphics. You can see all these pretty features yourself! Just download demo-version, and start a new campaign. Not only you will see the new graphics. We give full access to our Face Editor. So you can play with it, create faces, experiment. Have fun! The concept is not bad but I prefer the normal size football manager games. If you guys can work on different body types and you find the balance between head and body then that would be very nice. Also it is a very good job you spent time and energy to make this face generator because in many mmos still not a standard this feature and this one contains more than those games. So all in all not a bad idea but I prefer a real football manager game but if you keep the rpg elements and turn into real time would be more likely to buy. The pricing also okay for the game because not cheap and not expensive. In many ways, FT is better than "normal manager games", because it gives you the understanding of how your tactical and strategical decisions really matter. The matches are not a black box which generates strange results. Turn-based mechanics allows you to use your tactics smartly. But it's stylized, not realistic. So yeah, we do not compete with Football Manager. Our game is more a tycoon than FM.